Hey, I am unable to hook the ice maker to a water to test out each unit I get. Does anyone know of a way I can test the ice maker and the inlet water valve without having a water line to hook into it? I use a light bulb. When the bulb lights up I count how many seconds (7.5) it stays lit to make sure it is filling ok. Okay, so how exactly do I hook the light bulb up? Anyone ever seen one of these before? I first seen them in a parts catalog I received in the mail a couple weeks ago. Here is what is says in my parts catalog about them. • Tester is very easy to use. 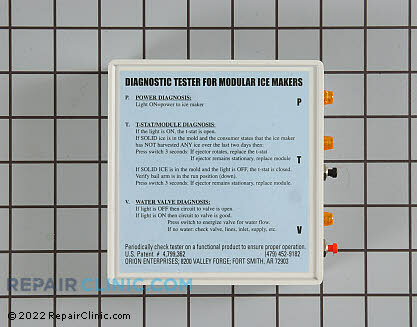 Simply replace the ice maker cover with the tester and follow the step by step instructions printed on the front of the tester. • Allows for quick and accurate diagnosis of ice- makers used on all Whirlpool, KitchenAid, Estate, Roper, Amana, Maytag, Sub Zero, and Kenmore refrigerators. • Technicians have commented that the tester gives them a more professional image when dealing with the consumer. • By saving 15 - 30 minutes per service call the tester quickly pays for itself. So that will test to see if the water will fill properly and if it will dispense ice? I have never used one or seen one in person. All I know about them is what I quoted from out of the catalog I have with them in it. I have always had water connected to any ice maker I ever worked on and simply used my multi meter to do any testing. If the light is ON, the t-stat is open. If SOLID ICE is in the mod and the light is OFF, the t-stat is closed. Verify bail arm is in the run position (down). Press switch 3 seconds: if ejector remain stationary, replace module. If light is OFF then circuit to valve is open. if light is ON them circuit to valve is good. Press switch to energize valve for water flow. If no water check valve, lines, inlet, supply, etc. i have used one for about 2 years and have liked it. That's good to know, I may order one. Make a watered down suicide cord. Add some 1/8th inch pop rivets to it. Connect your cord to L and N. Get a light bulb and add a couple more pop rivets and shove em in V and T. Get another pop rivet and place it in H. Plug in your test cord and short the T and H connections just till you hear a CLICK then stop the jumping. If you kept it there the element would overheat and you would not want that unless you fill it up with water and sat it in the freezer before testing. (With the unit powered up on the watered down cord and the T and H jumpered we bypass the ice mold thermostat and fire the motor and the heater up. At the click you stop the jumpering to kill power to the heater) When the gear goes all the way around dang near to the end the light bulb comes on for 7.5 seconds. Note: Be ready to kill power to the unit in case it has issues. For my watered down power I use a heater element to absorb the power in case the ice maker shorts out. If their was a short the element would absorb the energy before the machine you are testing is harmed. It is 120volts but it is weakened and watered down to a trickle. $108 for an icemaker tester? Don't waste your money. Just jump T to H with an insulated wire. That will start the icemaker. Pull the wire out after a few seconds. Then go back the inlet valve, put your meter leads on the valve terminals and wait. When the ejector fingers reach about high noon the icemaker it will send voltage to the valve for about 7 seconds. The voltage is in series with the mold heater so it won't be 120 VAC, it will be about 107 VAC. The best way to know for sure if it works is to hook it up to water and let it run. I bet you could find fittings to adapt it to your garden hose. If that's not possible, just fill the icemaker with water. If your freezer temperature is cold enough, it should eject the ice within an hour or two. Make yourself 2 jumper wires 1 that will jump V-L that is the water valve. If water runs to the im the communication to the valve and the valve are good, if not test the valve, it is probably bad (jumper for only a few second). Next make a jumper wire to jump from T-H listen for click (approx 3 sec.) let IM run through cycle, water valve should activate about the same time the arm drops or the notch in the wheel is at 4 o'clock, if no fill occurs replace module (bad contacts behind wheel) but the IM probably should be replaced because the coating on the mold is probably worn also.